If you have four really great songs that people absolutely love, and seven songs that are just okay. Just record those four songs. 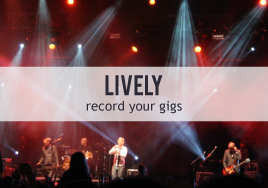 You’ll cut your cost drastically, and you’ll be giving fans the music they truly love. You also have to decide whether or not to work with a producer. Producers have been a part of recorded music since its inception, and they are an important part of the recording process. If you have a particular sound in mind, finding a producer who specializes in your genre can be a great way to make sure your music is comparable to what is currently available. Working with a great producer can also bring a valuable outside opinion on the music you will be recording. A producer can be one of the most expensive parts of your album. But a great producer who understands you and your music can take your album to new heights. Some artists love working with a producer, while other musicians prefer to do it all themselves. You have to decide what’s right for your music. If you have found a producer you trust, and can afford them, I recommend you hire one. Often producers and sound engineers are the same person, especially for smaller projects. This can help you cut costs while still reaping the benefits of having a producer. At home recordings and DIY studios have come leaps and bounds in the past few years. It’s now possible to make a great sounding record at home. However, there are still costs associated with this. The equipment needed to build a professional sounding at-home studio is still quite expensive. If you don’t already have the tools you need at home, you may find your initial budget gets eaten up quickly on equipment alone. If you are a beginner in home recording, even though your initial investment in equipment may be higher, you could save money in the future if you already have all the tools needed to make great music in your living room. Even though it can be cheaper in the long run to record at home, studios are still an important part of making great records. Studios have high quality equipment, rooms that are acoustically engineered for great sound, and either an in-house engineer, or a recommendation for an engineer they trust. 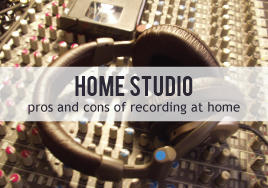 If you don’t have the patience or time to invest learning how to make a great sounding recording at home, a studio may be the best place for you. Many musicians work out a hybrid of the two. You may find your living room isn’t the best place to record a full drum kit (and your neighbors might hate you!) but it is the great place for tracking acoustic guitar and aux percussion. Working out a deal to combine the best of both worlds may cut your cost significantly. Many producers/engineers have a great home studio setup. They may charge you a reduced rate to record there, or just bundle it in with the fee they charge you initially. This can save you loads of money on studio hourly fees and per day rates. Ultimately tracking at home is the cheapest option. But you have to decide if that’s the best option for your music and your career. Remember: Although it’s definitely possible to make great music at your house, there is still a standard of quality that you will have to meet. Even a casual music listener can tell when something doesn’t sound the way that they are used too. When you are deciding between recording at home or in a studio, think ahead to how you want the album released, and what kind of opportunities, like licensing and radio airplay, you will want to pursue with these songs. Then make sure the quality of your recording matches up with other songs that are being released on those platforms. Another costly item is studio musicians. If you are in a band, this is less of an issue, although you still may want to hire session players for strings or other auxiliary instruments. If you are a solo artist who wants an album with a full band sound, this is a much bigger concern. Every musician charges different rates, but there is probably a “normal” dollar amount that musicians are charging in your area. Remember, the quality of the musicians you choose will drastically affect the quality of the music you are recording. Shop around a little, and find the best musicians for your project. To cut costs, ask a friend who is great at their instrument if they would be willing to help you out. If you are involved in your local music scene, collaborating with other artists can also be a cheaper alternative to hiring studio musicians. Remember that though the tracking may be finished, the project isn’t. You will have to pay for mixing, mastering, and your disc packaging/digital distribution. 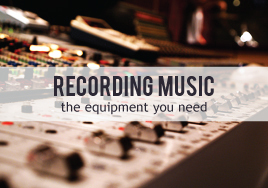 All of these things are vital steps in the recording process that you shouldn’t skip. Mixing might be the most important part of recording a song. No matter if you recorded at home, in a studio, or with a producer, mixing can make or break your record. Do some research, and find the best engineer you can afford. Many digital distributors and disc manufacturers like Nationwide Disc offer mastering services at great rates. Again, this is a step that shouldn’t be skipped if you want your recording to be the same quality as the songs that major labels are releasing. There are many factors that will affect the amount of money you spend on your new project. But with some research you can decide what you really need to make your project exactly what you want it to be. Once you know what you need, you can find ways to significantly cut your budget. This applies to a record you made by yourself at home, or a fully produced album made in the most expensive studio in town. 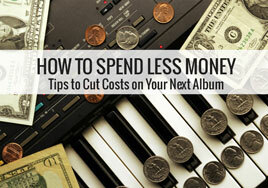 How have you cut costs on albums you’ve recorded? What part of an album do you think artists should invest the most money into? Let us know in the comments below! One note: Just as you want to be compensated fairly for your work as an artist, your friends, other musicians, producers, and sound engineers do to. If people are willing to work with you for free or a reduced rate, that’s great. But don’t short change your fellow musicians who are working just as hard as you are to have a sustainable career in the music industry.